As part of the EcoAqua programme, new and innovative methods are being used to determine the hydraulics (mixing etc) in pill ponds. This system operates by storing biomass (fish) in one end of the pond (as per Figure 1) and circulating flow in and out of this region (e.g. using paddle wheels) guided by baffles and walls. Figure 1: Typical pill ponds surveyed as part of the EcoAqua programme. This work focuses on developing a better understanding of the aeration and flow technology requirements for these aquaculture systems. The ability of the technology to drive water around the pond. The ability to deliver and mix oxygen into the biomass areas of the pond. The ability of the technology to carry away enriched waters from the biomass area of the pond. A number of hydraulic methodologies will be deployed to enable a complete analysis of the hydraulics (including mixing etc.) in the ponds and also enable future computational fluid dynamic modelling of the pond. 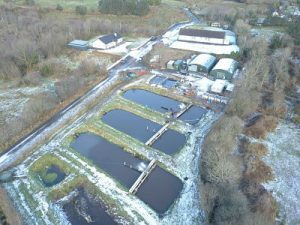 One of the novel approached being taken by the EcoAqua project is the use of aerial drones and particle image velocimetry (PIV) (Figures 2-3). PIV is an excellent method to determine advection and turbulent diffusion globally across the pond surface as a result of the flow source. 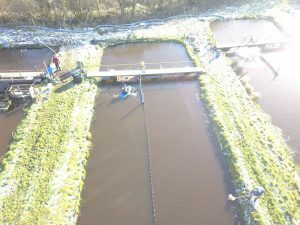 Figure 2: Aerial footage of the partner site being surveyed. Figure 3: Recovery of the particles used in the PIV study.